From the producers of Nana and 42 Weeks, comes an exciting new production: Daddy’s Girls. Written by Gbadero Lahanmi and Ifunanya Ifeacho, Daddy’s Girls details what happens when we take a peek at what truly lies behind the perfect family facade. Harmony and her sister Zoe are invited home by their parents who want to celebrate their father's retirement as a diplomat and his birthday all in one weekend. As preparations for the festivities ramp up, everyone but Harmony is looking forward to it, who's burning desire is to gain closure by revealing a family secret. Harmony is still recovering from the devastating aftermath of her first attempt but this time, she means business. Her mother Millicent wants nothing more than for her husband's party to make headlines for all the right reasons. As events reach a climax, will Harmony get what she wants? Once the secret is out - will it really bring the closure she so desperately needs? ...Can the truth set her free? Highly acclaimed playwright and director, Gbadero Lahanmi, has put together a poignant drama showing for two nights in November in West Kensington, London. 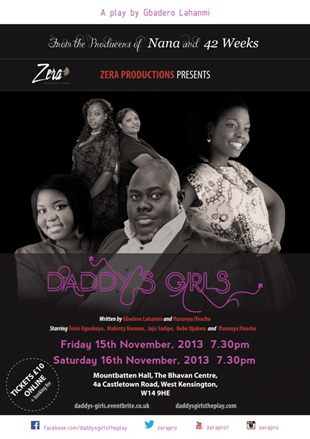 Info: Daddy’s Girls is on at the Bhavan Centre (4A Castletown Road, W14 9HE) on 15-16th of November 2013, 7:30pm. Book tickets. Please note - this production contains adult themes and is not suitable for under 16s.